5 Comments on A Migraine Must Have! Generally, throughout my recovery, I would say I’ve been taking two steps forward with the occasional one step back. Well this week, it’s felt more like one step forward and two steps back. Just when you feel like you are making progress, out of nowhere, you get hit by that ominous feeling which unfortunately seems so familiar to you. My neck muscles tense, my head starts to pulse, and the unquenchable thirst sets in. That’s when I know it’s time to batten down the hatches and take cover for a few days, until the storm decides to pass. Sadly, as soon as one storm passed this week, a second one hit, just a couple of days later, which naturally left me feeling extremely low and exhausted from all the turbulence I had been facing. After a while, you do start to wonder whether you will ever get to see that beautiful clear blue sky again? 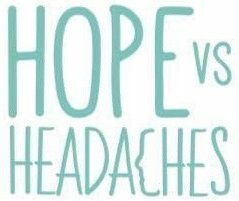 So rather than going into detail on how unpleasant, depressing and painful my week has been, I wanted to use this time in a positive way to tell you all about the anti migraine device that I simply cannot live without! Please let me introduce you to my saviour… Cefaly! This device is designed to prevent and treat migraines by attaching an electrode to your forehead through an adhesive strip, which then sends micro-impulses to stimulate the nerve endings to the Trigeminal nerve. This is the nerve that is nearly always involved when a migraine is triggered. It’s located at the exit of the eye socket and underneath the skin of the forehead. The best way to explain this device, would probably be that it’s a form of tens machine, but specifically designed to target migraines and not just pain in general. The first setting is for when you can feel a migraine coming on or if you are in a full-blown attack. For me, this is the most powerful of the three so I tend to use this most of the time. Setting two, prevention, is designed for you to wear anytime, even on those good days, just to prevent any future attacks. This setting is slightly less intense but produces a very similar feeling to the first. Then thirdly, the anti-stress setting is designed for relaxation, which I can best describe as a tingling massage for your scalp and eyes. When you first use the device the feeling can be pretty intense and uncomfortable, but persevere with it, because over time you will find that your tolerance to it will increase and it soon becomes a soothing, massaging feeling that you can’t get enough of! The way Cefaly works is that you select your setting by pressing the button either once, twice or three times, then the device will start the micro-impulses at a very low rate and build over a period of twenty minutes. At any time you can press the button again to stop the intensity building and maintain the level you require. Some days I can tolerate the full programme and other days I find just a light massaging is more suitable for how I am feeling. Now if you’re a pill popper, then this is most certainly for you. I’ve been there and got the t-shirt so I totally understand! I got to a point when I would wake every morning in anticipation to take my first dose of painkillers. I would then start to count the hours down until I could take the next concoction of drugs to try to ward off the daily headache that would just never go away. Paracetamol, Syndol, Migraleve or Panadol! It didn’t matter what it was as that vicious cycle of taking painkillers every four hours, in the end was what was actually giving me the headache! After visiting a specialist who diagnosed me with “Medication Overuse Headaches”; I had to go through one of the hardest months of my life and go cold turkey, which meant coming off all painkillers and Triptans. The only way I could describe the rebound headaches I faced, was a kind of modern-day torture, that I would never, ever, want anyone to have to go through. However, what doesn’t kill you makes you stronger, and from that moment on I vowed to myself that I would never find myself back in that negative cycle of popping pills to cure a headache again. Hence when I learnt that this device could dramatically lower the number of painkillers and medication you consume, I was desperate to give this a go… and my god, they were right! I can get through a migraine now with only taking one Triptan at the onset and NO painkillers at all! NONE! For me, this is an absolute miracle! The intense massaging behind your eyes and of your scalp gives you incredible relief like I’ve never felt before. This device goes with me everywhere now; I cannot spend a night away from home without it tucked safely in my bag. My friends and family don’t even bat an eyelid now when I show up looking like I’ve just come from the set of Star Trek! Now let’s get to the cost. So Cefaly retails at approximately £250, which I totally agree, is a lot of money. However, after spending god knows how much on seeing Specialists, Botox treatments and nerve blocks with no avail, this one-off cost is honestly worth the investment and something that could hugely reduce the pain you suffer daily! I was so incredibly blessed as my Mum so very kindly bought this for me during my darkest of days, as she struggled to see me live in constant pain. I will always be so very grateful for her for this, anything was worth a try she thought! My Mum purchased it from the official Cefaly website as she wanted to make sure it was the real thing, and I would advise you to do the same. The adhesive electrode pads you have to buy separately (I buy them off Amazon), are normally around £15-£20 for three. However, if you look after them, I find they can be used up to ten times and sometimes more. I average about 2-3 migraines a month so one electrode normally lasts me roughly two months I would say. It’s great that you are sharing your story with the world, and insights into living the best possible life. I used to suffer from headaches, not migraines, but with age and change of my diet I don’t have much anymore. I’ve had 2 migraines in my life (I’m almost 50) and this past week I had experienced another one. It was strange, since I attributed my other migraines to either hormones or the epidural I’ve had after giving birth, because it only happened within that year after I had my 2 children. As I suffered through this time, I thought about you. And I really began to more deeply appreciate the work you do, in your writing about this and how you survive and thrive. For those who suffer through life with headaches and migraines, or know anyone who does, this might be an alternative to pills for coping. Next Entry Maybe The Answer Lies Within?